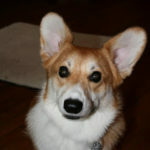 Tara C. of Georgia wrote to The Daily Corgi about her Pembroke Bunny, who’s come from an unloved life of being passed around to a loving home and a heroic job! 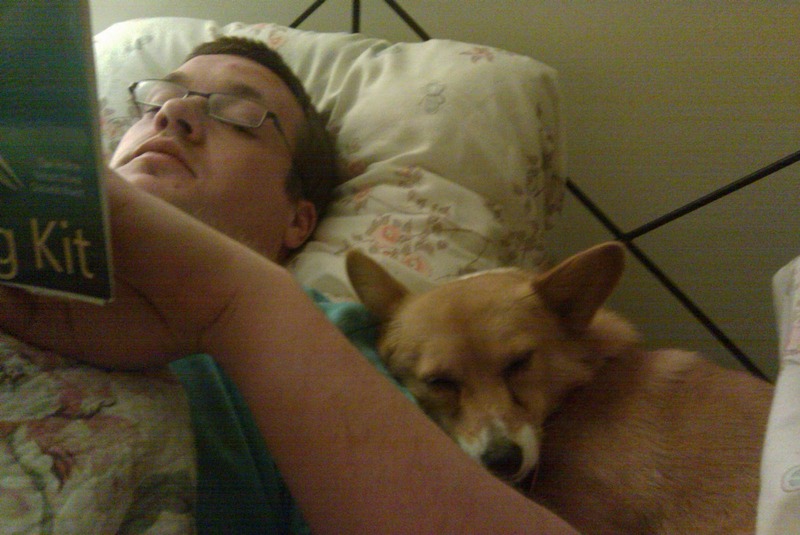 “I’d had dogs my entire life and never owned a Corgi. 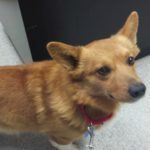 When my husband and I — well mostly I — were ready to add a second dog to our family, we started looking for a Corgi. (He likes the ears). 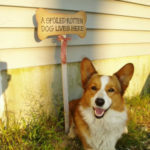 A friend of mine found an ad for a Corgi, located about two hours from where we lived. I was thinking this would be a big girl, but when we saw her, she was so small, only about twelve pounds. This little one came from a backyard breeder who had traded her for a lawnmower! The people who got her decided they didn’t want her after all, and she ended up in the hands of a former Corgi rescue lady who couldn’t keep her because their other Corgi would beat her up. She was four years old and had never lived inside! Thankfully she’d never had a litter. Her teeth were a mess and she wasn’t spayed. I was in love :). I decided to call her Bunny. We quickly realized this girl needed a little help. Bunny wouldn’t let us touch her feet or cut her nails and she would even bite. For the first probably six months, she never even barked. She was so scared of everything and we continue to work on that. Now, at six years old and fifteen pounds Bunny is still tiny for her age, and she is a doll who loves swimming and herding my other dogs. I don’t know how I lived without her. We have an amazing bond and she’s learned so much. Because of her past, Bunny requires a lot of patience, but I’m happy to say after two years she can shake, lay down, bow, and perform my husband’s favorite trick “Look cute, Bun!” I’m now Corgi obsessed — she’s definitely had an impact on my life! Bunny did a great job in early October as doggy ambassador for Friends of Pike County Animals. 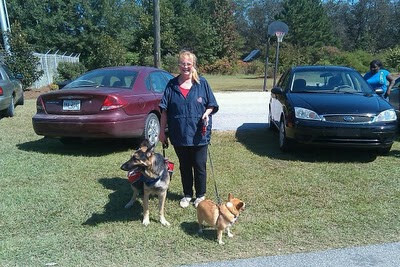 Her job is to spread the word about spay and neuter and help raise money to build an animal shelter in Pike County, Georgia. She met the mayor of Meansville, Georgia and even went on the hayride! A good friend suggested I would make a great dog trainer, and together we’ve joined forces with Friends of Pike County Animals to get homeless dogs off the street in a community with no animal control. We’ve vowed to help train these dogs and make sure their new homes last forever. 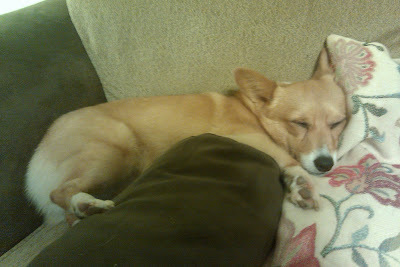 I see a lot of Corgis being re-homed because people don’t have time for them or understand their needs. 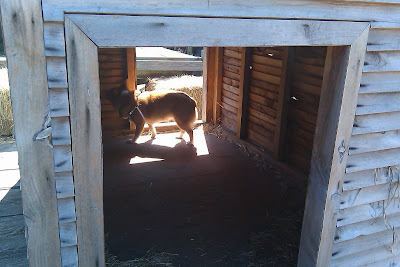 My experience with German Shepherds and Bunny opened my eyes to the needs of dogs bred to work. 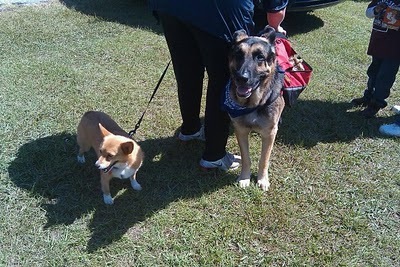 Our goals are to help people with working breeds like German Shepherds and Corgis, who can be misunderstood and undesired simply due to lack of training, and — with the assistance of Friends of Pike County Animals — help these misunderstood dogs find forever homes. This work has become a passion of mine. Of course, I’ve got dibs on any Corgis passing through Pike County! Welcome to The Daily Corgi, Bunny! Laurie thank you so much! Seeing Bun on the blog has brought tears to my eyes 🙂 Corgi on! An awesome story and very inspiring! Thanks for you work with this little girl when others would have given up.